At the age of 10, Harry Ostrander started playing trumpet in Sacramento, California. Since his start, Harry has played with a number of groups all over the country. From Concert Bands, Orchestras, Commercial Bands, and Jazz especially, Harry plays them all. He is currently a junior at CSU Long Beach as a Jazz Studies major, where he is a member of the Downbeat award winning Concert Jazz Orchestra. Harry hopes that he can pass his love and passion for music onto his students at Allegro Music. 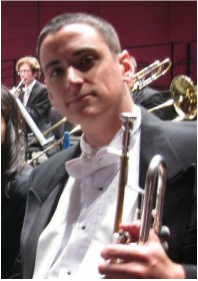 Andrew Rodman, trumpet, is an active freelance musician and educator in Southern California. He has performed with the Young Musicians Foundation Debut Orchestra, American Youth Symphony, Brentwood/Westwood Symphony, Los Angeles Doctors Symphony Orchestra, and The Orange County Wind Symphony. As a chamber musician, Andrew was a finalist in the prestigious Coleman Chamber Music Competition. Andrew completed his Bachelor of Music at the Bob Cole Conservatory of Music at California State University, Long Beach. His teachers have included Christopher Still, David Washburn, and Robert Frear.